1.e4 c5 2.¤f3 d6 3.d4 cxd4 4.¤xd4 ¤f6 5.¤c3 a6 6.Ґe3 e5 7.¤f3 Ґe7 8.Ґc4 0-0 9.0-0 ¤c6 Playing 9...Ґe6 after the game against Ivanchuk from round 2 has ceased to please Veselin, although the opening problems, raised before him by Vassily's outstanding play, look quite resolvable at that. 10.¦e1!? The usual continuation 10.Јe2 with an idea of drawing back the bishop on b3, leads the game to well-known standards. 11.Ґf1!? Anand's deep positional idea becomes clear; he takes advantage of the early development of black knight toс6 and switches to the Ј-side play. Black knight on с6 in the light of the a2-a4 attack and white knight's invasion on d5 stands unfortunately indeed. If rules would allow it Veselin Topalov will surely have played 11...¤c6-d7! with greatest pleasure. 11...¦b8! A good prophylactic move – it is not advantageous to exchange the white knight ready to jump on d5 (in this case White takes on d5 with the pawn, and black knight will have to return from с6 to its starting position), so Black prepares its "covering" from both sides with his pieces. The b8-rook plays an important role; it doesn't permit White to play a2-a4 (on this there follows a simple b5xa4, and the b2-pawn is under attack), and also covers the b6-square, which will be helpful in future. 12.Ґg5 This is, by the way a struggle for unquestionable possession of the d5-square. Besides, the bishop on e3 has blocked the way for the e1-rook, preventing it from defense of e4-pawn, which has hampered White knight's invasion on d5. 12...¤g4 In this case a knight is stronger than the dark-squared bishop. The knight is fixed on d5, White has slight but stable edge. 16...Јd7 Naturally, Topalov is no beginner to play 16...bxc4? 17.Ґxc4 ¦xb2 18.Јc1 , and White has a material advantage. 17.b3 Ґd8! Black bishop is getting ready to come out on the active position; at the same time the e7-square becomes free for the queen’s retreat. 18.¦c1 Ґxd5! 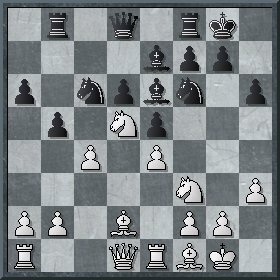 19.cxd5 The careless pawn sacrifice19.exd5?! ¤e7 20.c5?! ¤exd5 21.c6 Јa7! looks advantageous for Black. 19...¤e7 20.Ґd3?! A useful but somehow languid move. The bishop's position on d3 has a drawback – in prospect it may be attacked in case of black e-pawn being advanced, and it may be also attacked by a black knight from f4-square. At the same time pressure along the f1-a6 diagonal (supporting the a2-a4 attack) it has exerted from the f1-square also. [The immediate attack oh the Ј-side is not dangerous 20.a4 Ґb6 – the b5-pawn is unreachable, and at the same time Ґlack has won a tempo for developing his initiative on the ў-side. A maneuver that Vishy would execute in four moves: 20.¤h2 Ґb6 21.¤g4 ¤xg4!? (more reliable, but not as interesting is 21...¤h7 with subsequent f7-f5) 22.hxg4 f5! 23.gxf5 ¤xf5 24.exf5 Јxf5 25.Јf3 Ґxf2+! (25...Јd7 26.Јe4 Ґxf2+ 27.ўh2) 26.ўxf2 Јg4 27.Ґe2 with an unclear position. More energetically-looking is 20.¤h4! g5 (If 20...Ґb6 then strong is 21.Јf3!) 21.Јf3 (In comparison with the actual game 21.¤f3 looks preferable here too.) 21...ўg7 22.¤f5+ ¤xf5 23.exf5 with an initiative. 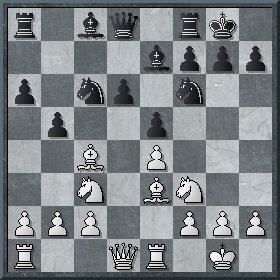 In comparison with the actual game, White here is not sure at all whether it is worth its while to develop his bishop on d3. 20...Ґb6 21.¤h4 g5 22.¤f3?! An admission of the inaccuracy committed on the move 20, Anand considers too risky 22.Јf3 ўg7 23.¦c6!? (to the move transposition may lead 23.¤f5+ ¤xf5 24.exf5 ¦fc8 25.¦c6 ¦xc6 26.dxc6 Јc7) 23...¦fc8! (bad is 23...gxh4 24.¦xb6 ¦xb6 25.Јe3 Јd8 26.Јxh6+ ўg8 27.Јxf6 ¤g6 28.Јxd8 ¦xd8 29.Ґa5 , and White wins) 24.¤f5+ ¤xf5 25.exf5 ¦xc6 26.dxc6 Јc7 27.Јg3 (weaker is 27.¦c1 d5 , and central pawns begin advancing at once.) 27...¦g8 (Move repetition won't work- on 27...¤h5? winning is 28.f6+! ; bad as well is 27...ўh7 28.h4! g4 29.Ґg5! hxg5 30.hxg5 ¤h5 31.Јh4 g3 32.Јxh5+ ўg8 33.ўf1 gxf2 34.f6, and White mates.) 28.¦c1, but it's the only way to struggle for the initiative. To my mind, white chances here are still higher, although Black has some trumps up his sleeve too. In the first round of Linares part of the tournament nobody but Alexander Morozevich had been kicking against the pricks, but his game ended in a draw as well. So in the game Morozevich – Carlsen White was fulminating. Alexander had been eager to win, but the one closer to victory was Magnus, who was parrying cavalry swoops calmly and coolly. Leko – Ivanchuk: from the opening the game was transposed into an equal endgame which for some reason had been estimated in the theory as favorable for White. Vassily had experienced no problems and in the end of the game even had a symbolic advantage. Aronian – Svidler: having chosen a rare opening variation, Levon Aronian failed to get his way – the opening results have been unfavorable for him, and the final position is in my opinion better for Black. Regretfully Peter has agreed to a draw and now seriously threatens Peter Leko's drawing records with his 8th draw in a row.